From Jane K. on Yelp. 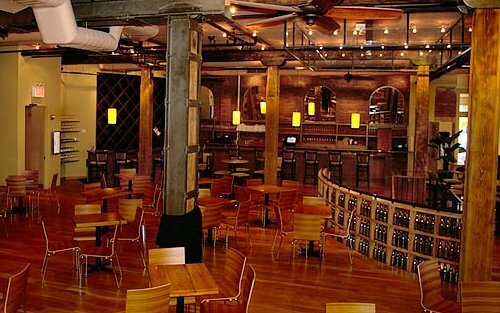 Today I had lunch with a freelance client at the City Winery on Tribeca's Varick Street. It was one of those meetings where the conversation flowed and veered off into fascinating topics well beyond the intended discussion. It was also one of those meetings where you're dumbstruck at just how small New York City really is. As if we're all actually connected to one another by six degrees. It turns out that my client - whom I met through a design firm that I partner with on the side - knows the owner of City Winery - Michael Dorf - quite well. Well enough that they've done some business together. But today I found out something even cooler. The same guy who owns City Winery was the founder and original owner of the legendary music haven, The Knitting Factory. Dorf eventually left the Knitting Factory a few years ago, trading in those hallowed beer-soaked floors for a bunch of wine barrels. But he hasn't left music. How could you? He continues to work as an event promoter, and the City Winery is also a performance venue itself with acts like Sixpence None the Richer and Suzanne Vega on the calendar. That puts me at just four degrees of separation from Luka. Only in New York. ISN'T THE NYC SODA BAN A LITTLE EXCESSIVE?